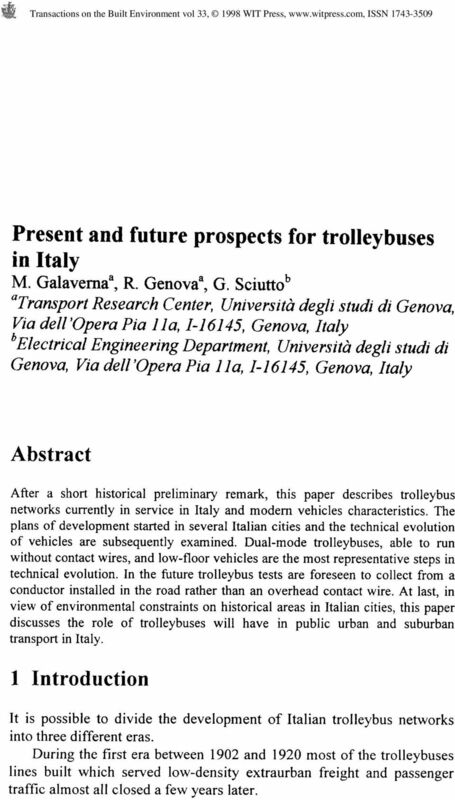 1 Present and future prospects for trolleybuses in Italy M. Galaverna*, R. Geneva*, G. Sciutto^ "Transport Research Center, Universita degli studi di Genova, Via dellvperapia lla, , Genova, Italy *Electrical Engineering Department, Universita degli studi di Genova, Via dell 'Opera Pia lla, , Genova, Italy Abstract After a short historical preliminary remark, this paper describes trolleybus networks currently in service in Italy and modern vehicles characteristics. The plans of development started in several Italian cities and the technical evolution of vehicles are subsequently examined. Dual-mode trolleybuses, able to run without contact wires, and low-floor vehicles are the most representative steps in technical evolution. In the future trolleybus tests are foreseen to collect from a conductor installed in the road rather than an overhead contact wire. 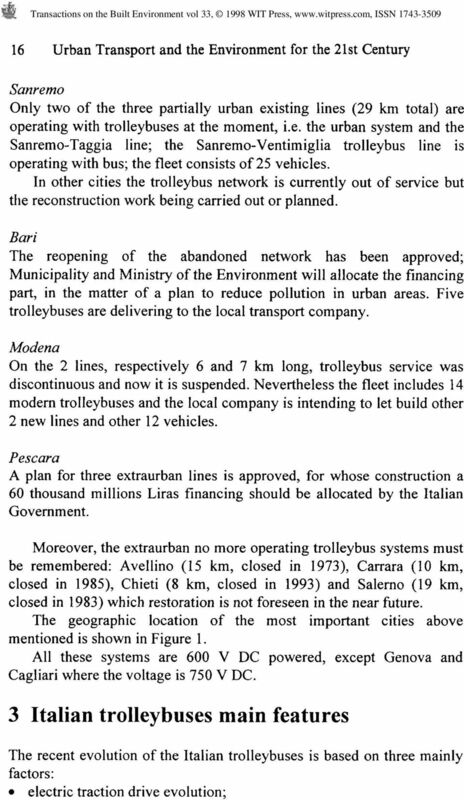 At last, in view of environmental constraints on historical areas in Italian cities, this paper discusses the role of trolleybuses will have in public urban and suburban transport in Italy. 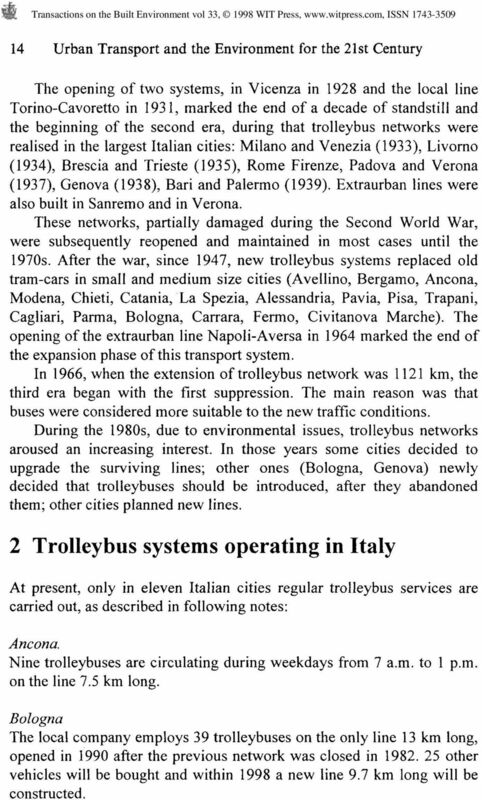 1 Introduction It is possible to divide the development of Italian trolleybus networks into three different eras. During thefirstera between 1902 and 1920 most of the trolleybuses lines built which served low-density extraurban freight and passenger traffic almost all closed a few years later. 2 14 Urban Transport and the Environment for the 21st Century The opening of two systems, in Vicenza in 1928 and the local line Torino-Cavoretto in 1931, marked the end of a decade of standstill and the beginning of the second era, during that trolleybus networks were realised in the largest Italian cities: Milano and Venezia (1933), Livorno (1934), Brescia and Trieste (1935), Rome Firenze, Padova and Verona (1937), Genova (1938), Bari and Palermo (1939). Extraurban lines were also built in Sanremo and in Verona. These networks, partially damaged during the Second World War, were subsequently reopened and maintained in most cases until the 1970s. After the war, since 1947, new trolleybus systems replaced old tram-cars in small and medium size cities (Avellino, Bergamo, Ancona, Modena, Chieti, Catania, La Spezia, Alessandria, Pavia, Pisa, Trapani, Cagliari, Parma, Bologna, Carrara, Fermo, Civitanova Marche). The opening of the extraurban line Napoli-Aversa in 1964 marked the end of the expansion phase of this transport system. In 1966, when the extension of trolleybus network was 1121 km, the third era began with the first suppression. The main reason was that buses were considered more suitable to the new traffic conditions. During the 1980s, due to environmental issues, trolleybus networks aroused an increasing interest. 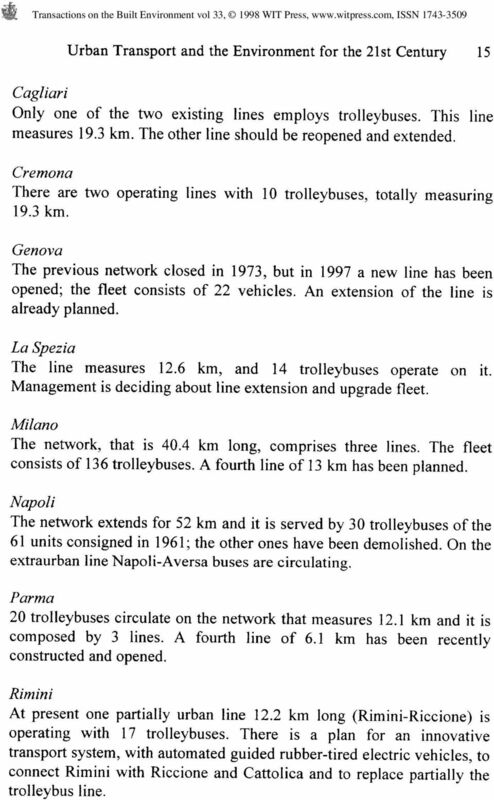 In those years some cities decided to upgrade the surviving lines; other ones (Bologna, Genova) newly decided that trolleybuses should be introduced, after they abandoned them; other cities planned new lines. 2 Trolleybus systems operating in Italy At present, only in eleven Italian cities regular trolleybus services are carried out, as described in following notes: Ancona. Nine trolleybuses are circulating during weekdays from 7 a.m. to 1 p.m. on the line 7.5 km long. Bologna The local company employs 39 trolleybuses on the only line 13 km long, opened in 1990 after the previous network was closed in other vehicles will be bought and within 1998 a new line 9.7 km long will be constructed. 3 Urban Transport and the Environment for the 21st Century 15 Cagliari Only one of the two existing lines employs trolleybuses. This line measures 19.3 km. The other line should be reopened and extended. Cremona There are two operating lines with 10 trolleybuses, totally measuring 19.3 km. Genova The previous network closed in 1973, but in 1997 a new line has been opened; the fleet consists of 22 vehicles. An extension of the line is already planned. La Spezia The line measures 12.6 km, and 14 trolleybuses operate on it. Management is deciding about line extension and upgrade fleet. Milano The network, that is 40.4 km long, comprises three lines. The fleet consists of 136 trolleybuses. A fourth line of 13 km has been planned. Napoli The network extends for 52 km and it is served by 30 trolleybuses of the 61 units consigned in 1961; the other ones have been demolished. On the extraurban line Napoli-Aversa buses are circulating. Parma 20 trolleybuses circulate on the network that measures 12.1 km and it is composed by 3 lines. A fourth line of 6.1 km has been recently constructed and opened. Rimini At present one partially urban line 12.2 km long (Rimini-Riccione) is operating with 17 trolleybuses. There is a plan for an innovative transport system, with automated guided rubber-tired electric vehicles, to connect Rimini with Riccione and Cattolica and to replace partially the trolleybus line. 5 Urban Transport and the Environment for the 21st Century 17 Figure 1: Main cities cited in the text installation of an on-board autonomous group to provide vehicle operations without overhead line; low-floor. The evolution of the electric traction drive is articulated in four steps: DC motor and rheostatic speed regulation by electromechanic control of the contactors; DC motor and rheostatic speed regulation by solid-state device control; DC motor fed by a power chopper; three-phase AC induction motor fed by a direct-pulse inverter. 6 18 Urban Transport and the Environment for the 21st Century First type traditional traction drives, installed on all old generation trolleybuses, was built until Subsequently, since it seemed that trolleybuses system should be abandoned, for ten years no one Italian producer built any kind of new vehicles. The consequence was that the transport companies intentioned to keep on with this transport modality, met a lot of difficulties to renew their fleets and had to buy new units from foreign constructors. Between 1981 and 1985 the interest to this system grow up again and 41 trolleybuses equipped with traditional system (rheostatic with electromechanic or electropneumatic contactors) were produced for Cagliari, Milano and Sanremo. In order to eliminate the abrupt acceleration and to obtain a better speed regulation, improving passengers comfort, the Italian manufacturer Ansaldo experimented in 1975 an electronic control device for the contactors to switch-off the sections of the starter rheostat. Between 1975 and 1987, 143 trolleybuses with Ansaldo equipment were constructed for the systems in Rimini, Sanremo, Parma, Salerno, Cremona, Ancona, Milano, Cagliari and Modena. 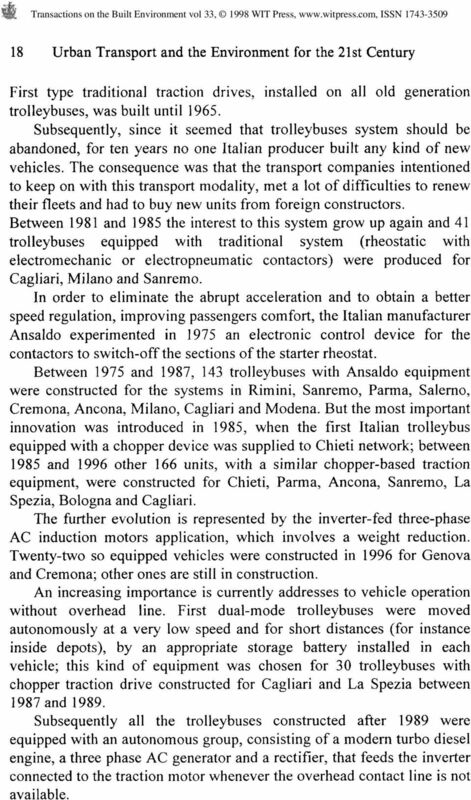 But the most important innovation was introduced in 1985, when the first Italian trolleybus equipped with a chopper device was supplied to Chieti network; between 1985 and 1996 other 166 units, with a similar chopper-based traction equipment, were constructed for Chieti, Parma, Ancona, Sanremo, La Spezia, Bologna and Cagliari. The further evolution is represented by the inverter-fed three-phase AC induction motors application, which involves a weight reduction. Twenty-two so equipped vehicles were constructed in 1996 for Genova and Cremona; other ones are still in construction. An increasing importance is currently addresses to vehicle operation without overhead line. First dual-mode trolleybuses were moved autonomously at a very low speed and for short distances (for instance inside depots), by an appropriate storage battery installed in each vehicle; this kind of equipment was chosen for 30 trolleybuses with chopper traction drive constructed for Cagliari and La Spezia between 1987 and Subsequently all the trolleybuses constructed after 1989 were equipped with an autonomous group, consisting of a modern turbo diesel engine, a three phase AC generator and a rectifier, that feeds the inverter connected to the traction motor whenever the overhead contact line is not available. 8 20 Urban Transport and the Environment for the 21st Century in tramway sector there was a remarkable development of new projects (many prototypes of innovative light rail vehicles have been introduced) and plans for new lines, but in very few cases these planned lines were realised and the new realisations took place in cities already equipped with tramways; for lack of a unified model of tram-cars, different vehicles have been developed for each transport company, which result in high costs. 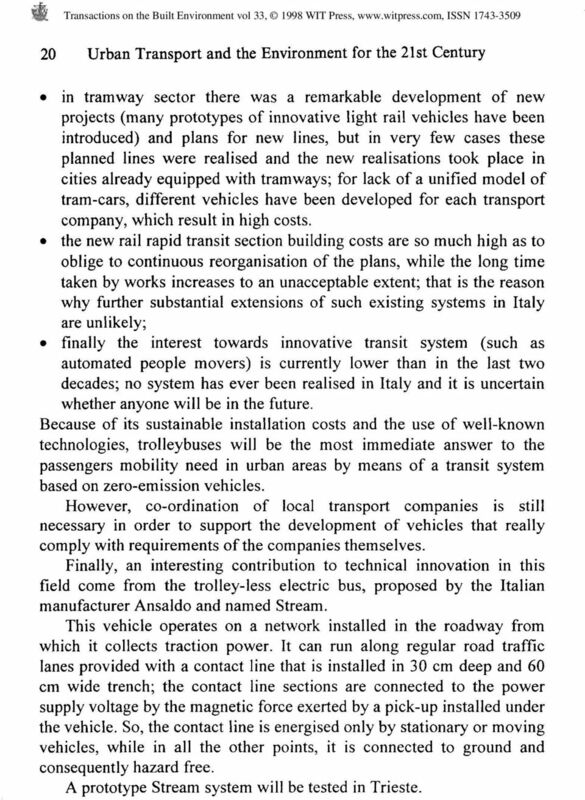 the new rail rapid transit section building costs are so much high as to oblige to continuous reorganisation of the plans, while the long time taken by works increases to an unacceptable extent; that is the reason why further substantial extensions of such existing systems in Italy are unlikely; finally the interest towards innovative transit system (such as automated people movers) is currently lower than in the last two decades; no system has ever been realised in Italy and it is uncertain whether anyone will be in the future. Because of its sustainable installation costs and the use of well-known technologies, trolleybuses will be the most immediate answer to the passengers mobility need in urban areas by means of a transit system based on zero-emission vehicles. However, co-ordination of local transport companies is still necessary in order to support the development of vehicles that really comply with requirements of the companies themselves. Finally, an interesting contribution to technical innovation in this field come from the trolley-less electric bus, proposed by the Italian manufacturer Ansaldo and named Stream. This vehicle operates on a network installed in the roadway from which it collects traction power. It can run along regular road traffic lanes provided with a contact line that is installed in 30 cm deep and 60 cm wide trench; the contact line sections are connected to the power supply voltage by the magnetic force exerted by a pick-up installed under the vehicle. So, the contact line is energised only by stationary or moving vehicles, while in all the other points, it is connected to ground and consequently hazard free. A prototype Stream system will be tested in Trieste. 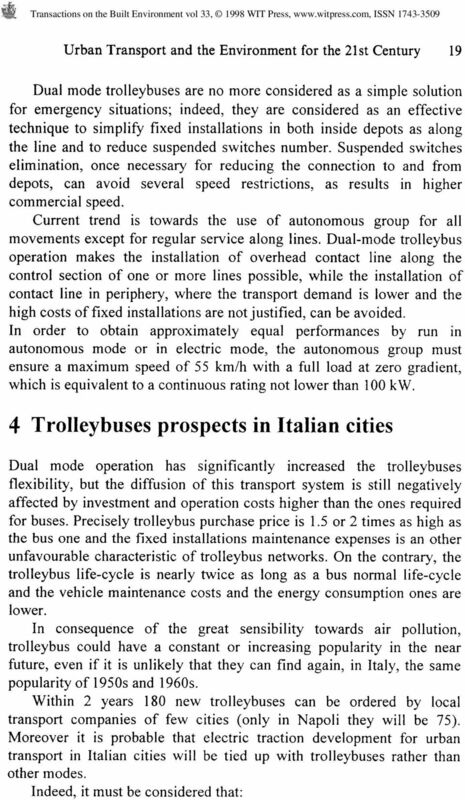 9 Urban Transport and the Environment for the 21st Century 21 5 Conclusions This paper resumed the results of a research activity aiming at analysing the present situation of trolleybus system in Italy. All systems currently operating in Italy have been concisely described and also the main modern features have been mentioned. Then, the prospects of this transport mode have been considered. Although dual mode operation has significantly improved their flexibility, trolleybuses still have higher purchase prices and operation costs than buses. Nevertheless, because air pollution is felt as a critical factor for the life quality in several Italian cities, interest in trolleybus will remain constant or will increase in the next few years. Finally the innovative prototype of the trolley-less electric bus named Stream has been mentioned. 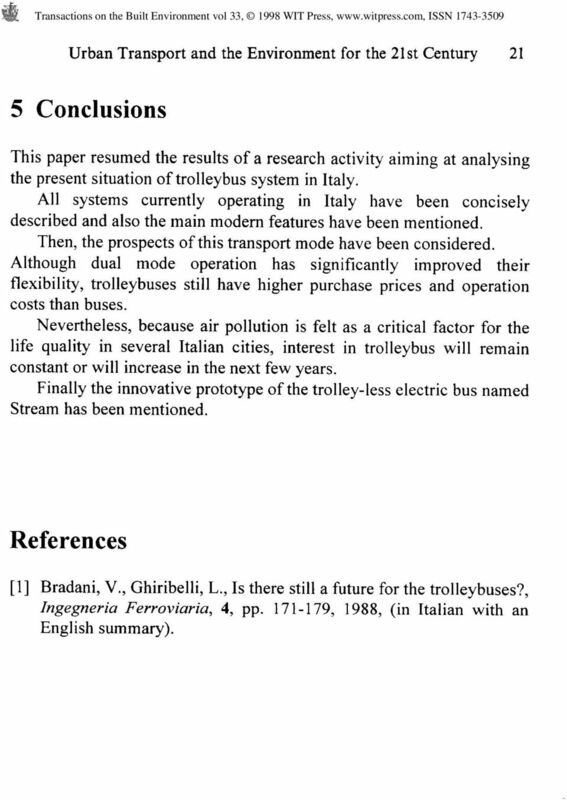 References  Bradani, V., Ghiribelli, L., Is there still a future for the trolleybuses?, Ingegneria Ferroviaria, 4, pp , 1988, (in Italian with an English summary). Who we are. We are 17,000 men and women who form a cooperative banking group with 1,800 branches. MISSION STATEMENT 01. The Maccorp Group was founded in Italy in 1990, opening its first bureau de change in Venice in 1991. Rai Way. The road to travel in the communication world. Electric Power in Airplane Student: Maja Knezev Course ELEN 615, 31 st August 2006 Power sources on aircraft engine driven AC generators, auxiliary power units (APUs), external power and ram air turbines. MiSSiON StAtEMENt 02. The Maccorp group was founded in Italy in 1990, opening its first bureau de change in venice in 1991. Today Eurocrea is organized in three different business units: Eurocrea Consulting; Eurocrea Financial Services; Eurocrea Merchant.